Darn Tough Vermont makes the best socks on the market today. This family run business does one thing and one thing well, and that is make Merino Wool socks in their Northfield, Vermont mill. Even better, they are guaranteed for life, no questions asked. If your Darn Tough socks ever get a hole in them, bring them back to us, or mail them to Vermont, and you’ll get a new pair, absolutely free. Still not convinced, here’s just a sampling of the Darn Tough testimonials. 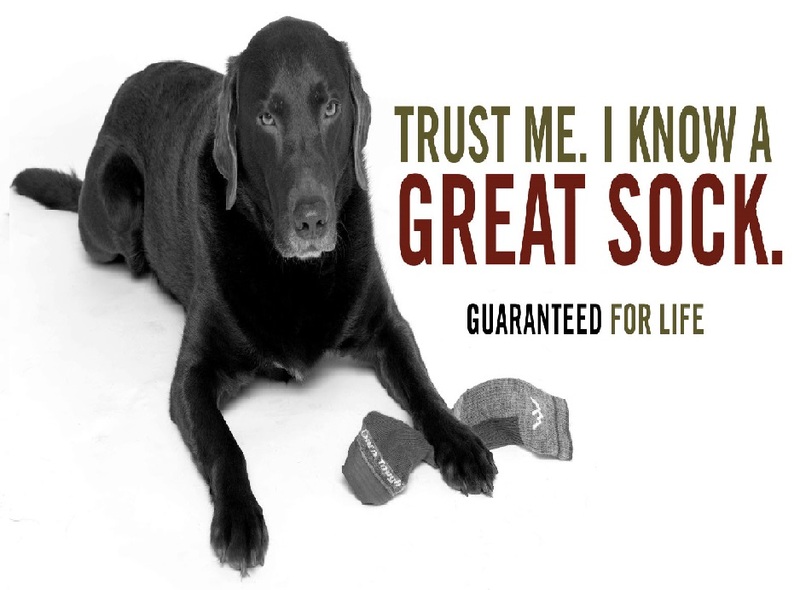 Come in and visit us at Cascades Outdoor Store with the largest selection of these amazing socks in the West. My name is Jeff, aka “Rags,” short for Raggedy Man. I hiked the PCT at the age of 59 in three months and 28 days. I used other socks and wore them out in just a week and then I bought yours. End of story… they lasted 2000 miles. They are still good and if I ever wear them out I won’t ask for another pair. I damned sure got my moneys’ worth out of these. They were worth every dollar I paid for them and more. Thank you for one less problem in my hike. I will support you and recommend you forever. I’ve bought several pairs of your socks over the past couple years. I don’t wear shoes in the house: my socks get a LOT of wear, being used most of time as slippers. As you can imagine, I’m used to tossing socks out, with holes in the ball and heel, at rather frequent intervals. Your socks show no sign of wear. When and if I ever do wear a hole in one, I will not be using your lifetime guarantee, since I will certainly have gotten my money’s worth and would happily pay for a replacement. Anyone who considers them expensive hasn’t done the math on how many other pairs of cheaper socks they’d need to buy instead. Being made in the US is worth a *lot* to me. I seek out and will pay more for quality goods still made in the US. I know too many people whose jobs were outsourced so a company could produce a less expensive product. I don’t know the solution to this chase to the bottom, but I’m glad your company is bucking the trend. My most distinguishing physical trait is my feet. They are a truly strange feat (no pun intended) of nature. They’re arched so high that only the heel and ball actually touch the ground. It’s scary. Kids dress up for my feet on halloween. The tragedy of my feet is that due to the abnormal weight distribution, they tear through every pair of socks. The socks that my mom got me for Christmas are already dead, and it’s not even April Fools Day yet. There is only one brand of socks and can contain my little piggies. DARN TOUGH VERMONT. Seriously, your socks are magical. What do you put in them? Pixie dust? It must be. My darn tough socks have lasted me FOUR YEARS. That is 12 times longer than my average sock – and they’re still going! They show no sign of wear and tear. It’s witchcraft. Thank you, Darn Tough Vermont. Last weekend I fell through the ice on the shoreline of Lake Michigan – and had to limp into Chicago as 30 mph wind chills froze my pants solid. At serious risk of frostbite, I busted into the nearest coffee shop and changed and dried off. The skin on my legs was numb and red – but my feet were perfectly fine. Darn Tough socks had insulated them so well. I just wanted to say thank you! Without your socks, I might have less toes. I just received a brand spanking new pair of socks because mine had a hole after wearing them once. I wasn’t even sure if my sock dilemma would fall under the warranty because of the odd hole. At best, I was expecting a patch over the hole. I’d just like to say thank you VERY much for my new socks! Now I have two pairs that I adore and great things to say about your company. So when people notice my awesome socks, which they do because I’m a Portland, OR cyclist so my pant legs tend to be rolled, I will proudly say, “they are Darn Tough Vermont socks!” Heck I’ll even tell them a few different places in town they can pick a pair up. I bought my first two pairs of Darn Tough socks prior to a thru-hike of the Appalachian Trail. I used those two pairs for the full length of the trip (over 2,000 miles!) and am still wearing them today. All I can say is Wow! I used to think the best thing about Vermont was Bernie Sanders. But now I have your John Henry Boot socks. My feet have not felt this good since I was twenty. The fifty years since then have been a long long time. Please thank everyone at Darn Tough for me. What you make, makes the world a better place for everyone with feet. I love your socks. Tell Bernie if you see him, we still love him just as much. Bernie is a national treasure, but he never made my feet feel like this. Hey-a few years back I dropped you a note telling you how awesome a single pair of Darn Tough Socks held up when I did the VT Long Trail over the course of a summer…and I have another ‘shout out’ to you guys…this summer I did 201 miles on the JMT (John Muir Trail-CA) in a nine day effort…HUGE days…however the two pair of Darn Tough socks were just awesome again! I even had another hiker (said he was from OHIO) who passed me holler out nice socks…he had them too! My name is Stacey, and I have hiked over 13,000 miles in the last 11 years on long distance trails. As you can imagine, my gear is very important to me, and when I find something that exceeds all my expectations I am ecstatic! Darn Tough Socks are one of those items. I bought my first 3 pairs of Darn Tough socks for my 2013 hike of the Continental Divide Trail (CDT). I always carry 3 pairs of socks with me when I am on a long distance hike. I try to wear each pair for 2 to 3 days and then rinse them in a stream if I have the opportunity and wear another pair while those dry. Every morning I beat my current pair of socks on the bottom of my shoe to get as much dirt out of it as I can. This really helps to extend the life of my socks. Those three pairs made it the length of the 2,700 mile Continental Divide Trail with no holes. Yes there were a couple of spots on two pairs that were almost worn through (a couple hundred miles more probably would have finally produced a small hole in them), but each pair stayed comfortable and fully functioning to the very end. I have never had a pair of socks that have lasted even half that long. I traded in two of those pairs for new socks, and kept the one pair that was not worn through. This summer I took them on my hike of the Idaho Centennial Trail and a little bit of the Pacific Northwest Trail, totaling approximately 1,000 miles. So that one pair of socks has now hiked over 3,700 miles and still does not have any holes in it. Toward the end of this summers hike it developed the same wear spots as its mates from the CDT, but still no holes. I am going to have a hard time sending those socks in to swap out for a new pair when they do finally get holes, we have developed quite a bond over all the miles we have covered together. I tell people about Darn Tough Socks every chance I get. And when I tell them about the Lifetime warranty the response I always get is “What?!? !” Keep up the awesome work! I am a lifetime Darn Tough Sock wearer for sure!